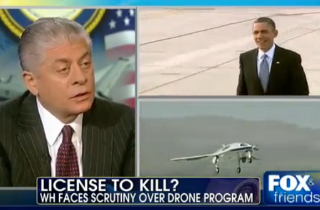 Appearing on Fox & Friends this morning, Judge Andrew Napolitano tore into the Obama administration’s program of targeted assassinations, as well as the new suggestion for a “drone court” panel to give congressional oversight for the killings. The Constitution grants no authority for government to kill anyone without due process, the judge maintained. “I’m not for the panel, and I don’t think the panel is consistent with the Constitution at all,” Napolitano said. “The very idea of a panel that somehow judges, meeting in secret, could authorize the president to kill people, presumes that the president and the judges have the power to do this. They don’t. “The Constitution says that if the government wants to interfere with your life, liberty and the pursuit of happiness, because it believes you’ve done something wrong, it can only do so through due process,” added Napolitano. The “due process,” the Fox judicial analyst explained, only includes issuing an official declaration of war or putting someone on trial. “The authority simply doesn’t exist, and it’s denied expressly by the Constitution,” the judge asserted. Host Brian Kilmeade countered that sometimes there’s a paper trail connecting a particular American citizen to terrorist activity. “Just because he was born in America, he shouldn’t be allowed to live,” the host said. “The Constitution makes no exception for the government shall not take your life without a jury,” Napolitano bluntly responded.